The Annual Appeal helps make up the difference between tuition revenues and the actual cost of an education. When you give to the Annual Appeal, every student and every teacher benefits from your contribution. The funds raised are invested in items and experiences that impact the students’ life on campus from athletic gear to science lab equipment, from field trips to computers, from songbooks and art pads to textbooks. 4Gifts may be made to the Annual Appeal fund which provides monies for the current year's operations. Donations may be designated for specific or general operational needs. To become a Guardian Angel for a Saint Paul student you won’t need wings, just a willingness to contribute as you can to the fund. 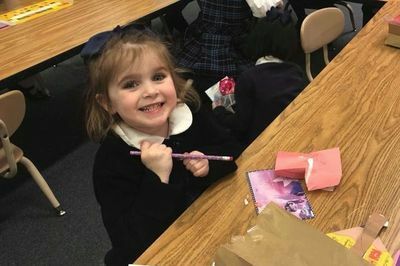 Your Donation to The Guardian Angel Tuition Assistance Fund can be directed to the general tuition fund or you can designate a specific student to receive your gift. By becoming a Guardian Angel, you will make a positive lasting impression on the life a child. You may direct your legacy to support Saint Paul Catholic School. By choosing Saint Paul as a beneficiary in your estate planning and wills you can direct gifts of stock, life insurance funds, appreciated securities, specific bequests, and establish trusts for the benefit of the school. Contact the Development office for the language to include in your estate planning. We also offer Electronic Funds Transfer (EFT) for ease in payment options. Your employer may match any contributions you make to charitable organizations, frequently doubling or even tripling your gift. Your company may also make a monetary donation to Saint Paul in exchange for community service hours you have completed. Your Human Resources department will have more information on your organization’s corporate matching program and will have the forms you need to accompany your gift.